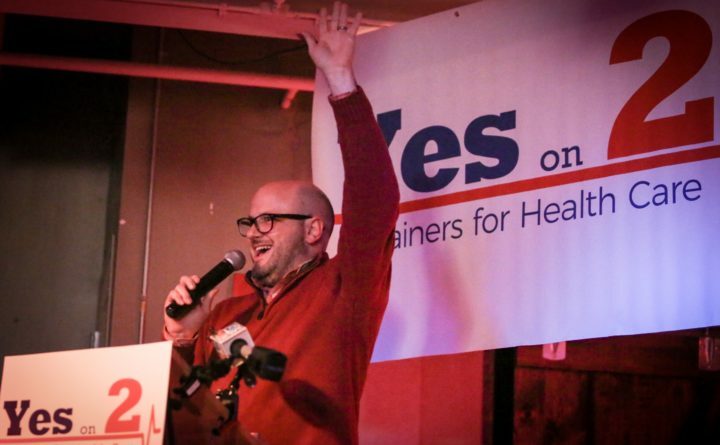 Jeremy Kennedy of Mainers for Healthcare rallys the crowd at the Yes on 2 headquarters in Portland, Nov. 7, 2017. Kennedy's group has campaigned for Medicaid expansion in Maine. Gov. Paul LePage’s goal of demanding payback from people receiving government-funded aid got a boost Thursday when the Trump administration announced it would allow work requirements for Medicaid recipients. Opponents called it cruel and illegal. President Donald Trump’s announcement to state Medicaid directors early Thursday reignited a debate about welfare eligibility requirements that has raged throughout LePage’s tenure. In 2014, his administration implemented federal work requirements for food stamp recipients that were previously waived in Maine. After Trump’s election, the state applied to the federal government to extend them and other provisions to the Medicaid program. Maine is one of 10 states with similar applications pending. Maine’s application asks that people who receive Medicaid, also known as MaineCare, be required to work 20 hours a week, disclose financial and property assets, pay monthly premiums and contribute $10 if they go to a hospital’s emergency room for non-emergency care. It would also eliminate retroactive coverage, which is currently provided for up to three months before a Medicaid application is filed. LePage defended his administration’s proposal and said it’s about helping people join the workforce and become financially independent. “These work-oriented activities end isolation, build relationships, improve quality of life and help move our economy forward,” said LePage in a written statement. Sen. Eric Brakey, R-Auburn, who co-chairs the Legislature’s Health and Human Services Committee, called Thursday’s development a “tremendous step forward” in the management of one of the most costly programs in Maine and across the country. Brakey is also running for the U.S. Senate seat currently held by independent U.S. Sen. Angus King. Rep. Patricia Hymanson, D-York, who co-chairs the health committee with Brakey, said reducing access to Medicaid will hurt the job pool in the long term because “people need their health to work.” She also criticized LePage for “an end-run around the Legislature” with his waiver application. “This is a policy maneuver disguised as a waiver,” she said. Others balked at the idea and signaled that legal challenges could be afoot. In Maine, one of the organizations that defends low-income Mainers’ access to social services is Maine Equal Justice Partners. Robyn Merrill, the organization’s director, said federal Medicaid law doesn’t allow work requirements as a condition of eligibility. Merrill said finding a job can be difficult or impossible for some Mainers because of problems with transportation, child care or other challenges, such as a lack of jobs in their area, but that none of those factors should be a decider when it comes to health care coverage. Brakey said it’s a challenge that can be overcome. “There are opportunities out there and all you have to do is a little work to find them,” he said. Hymanson said it’s not that easy, nor are co-payments for people who are already facing financial challenges. The federal shift on Medicaid work requirements could have ramifications for Maine’s efforts to expand Medicaid eligibility. Mainers voted last year to expand Medicaid under the provisions of the Affordable Care Act but there’s significant opposition from LePage and many legislative Republicans on the grounds that it is too expensive and taxpayer resources should be routed to the “most needy,” not “able-bodied” adults without children in the Medicaid program. Congressional efforts to repeal the ACA and the Trump administration’s general stance in favor of cutting welfare programs are already potent arguments against Maine taking the leap. It’s possible that implementing work requirements in tandem with offering benefits to new people could make expansion more palatable to lawmakers who wouldn’t consider it before. But it could also drive away Democrats who have staunchly opposed the concept.